Gofl's just a game--a game truly anyone can enjoy. 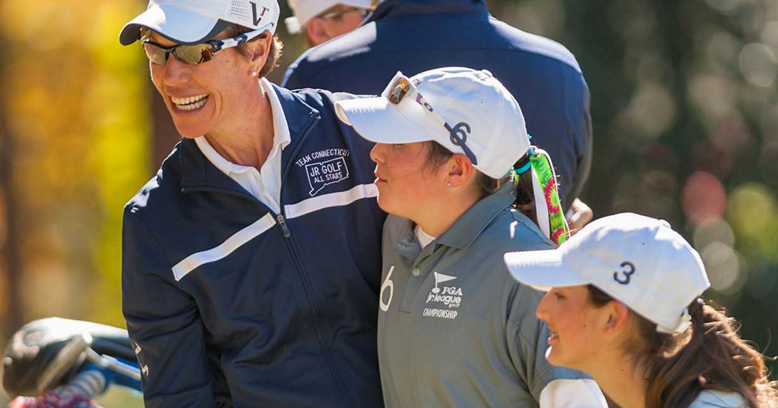 Suzy Wheley explains more about how women in particular can really learn to love golf fast. A golf instructor ranked in the Top 50 in the US, PGA Professional Suzy Whaley knows a thing or two about facing tough situations. She was the first women in 58 years to tee up in a PGA Tour event. Before and since, Suzy has gained a legion of fans and industry respect by her incredible athletic skill, her encouragement of men and women alike in the game, and her insight into t golf. She says learn some basic etiquette norms and learn the basics of a golf swing. Then, you can be comfortable and at ease playing golf. “You don’t have to be great to have fun, and more than anything, that is what women need to understand about this game,” says Suzy. Golf is, after all, just a game. There are hundreds of women (and men) instructors who love to help new players get comfortable and start having fun. The PGA, LPGA and USGA are great stops to find the resources you need.